For friends and readers who are still wondering if they should visit Manila, Philippines. Allow me to give you just one reason why you should : our FOOD. This is even putting aside the wide-array of local dishes that your palates will go crazy over... imagine the lechon (roasted pig), pancit palabok (glass noodles in orange achuete sauce with seafood), the kakanins in all shapes and flavors (rice cakes) and more! Never have I thought that I can get all patriotic until I'd get into a conversation with my foreign colleagues about our local Filipino food. Oh boy, I can definitely go on and on for hours! Lately, more and more restaurants and food concepts have been opening its doors all over the country. Take the newly opened SM Mega Fashion Hall for example. My list of restaurants to try in Manila could barely keep up with one restaurant opening after the other. It would probably take me a couple more visits to be able to try them all. I'm so blessed though that friends whom we would meet up with would give us the privilege to choose where we want to eat. That's why I love them so. Take for example my best friend L, of course, the holiday season will never be complete without us spending some quality time together. Sadly, her hubby T couldn't join us but she brought along my cutie godson TS who's such a sweetheart. 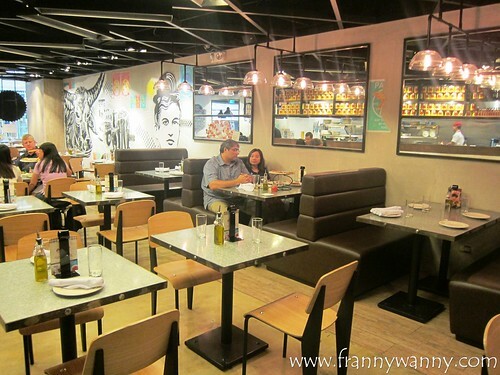 We agreed to have lunch at Linguini Fini, a restaurant that originated in Hong Kong and has opened its doors to the eager pizza/pasta-loving Manila diners. Knowing that we will be feasting all throughout the season, we agreed to just order for sharing in order not to fill ourselves up too much. Our meal began with White Gold Bars (Php. 365), which was a good choice. 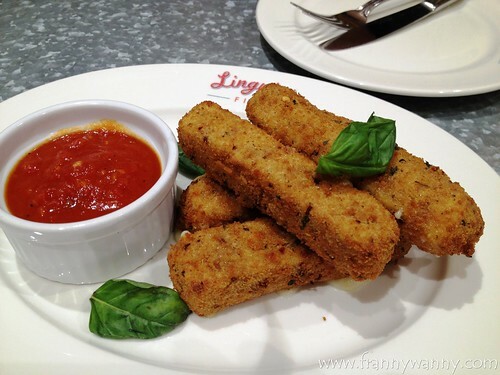 I love the crunchy deep-fried mozzarella bars served with their homemade marinara sauce. I love how the cheese stayed so gooey inside while the coating was so crunchy and yummy. It's a simple appetizer but one that we all loved! Linguini Fini, as the name suggests, is a restaurant that specializes in pasta. True enough, their menu had a long list of 15 different pasta dishes to choose from. Sensing our confusion, our server recommended the Bavette (Php. 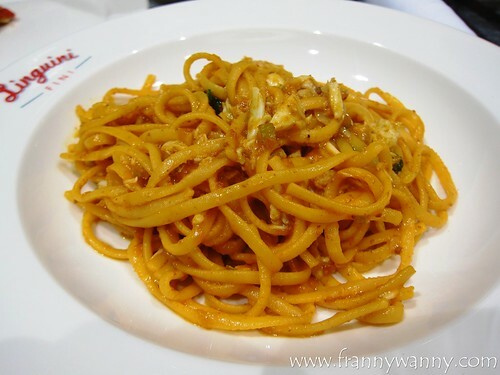 495) which she said was a light tomato-based pasta despite the inclusion of fresh crab meat, crab fat (aligue), chili, mint and lime (dayap). We requested for the kitchen to remove the chili which we're glad that they really did. Despite the aligue and mint combination though, I found the flavor to be still on the weak side. It was light, alright but it lacks that oomph to make it a memorable dish. The noodles were perfectly cooked though and even little TS enjoyed his spoonful of pasta. I'll probably try some other pasta dishes next time. 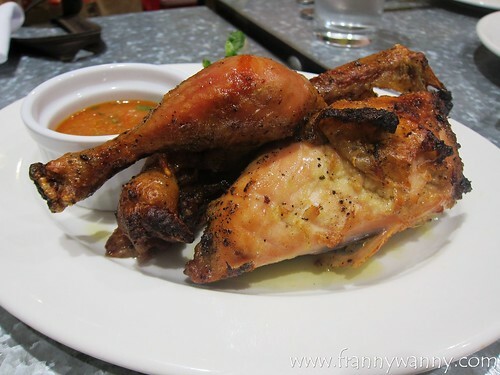 Lastly, we also tried the Lardo Roasted Half Chicken (Php. 395) which was sadly too dry and tasteless. We tried it with the cherry tomato and herb vinaigrette but the sauce can only do so much as the meat was a bit too tough to be enjoyed thoroughly. After having a small slice, we all wished we went for the Porchetta instead. Over-all, our experience at Linguini Fini was a mix of hits and misses. The White Gold Bars was really memorable and is something I'd love to go back for. However, I'm ready to give it another try and perhaps to try more of its main entrees and pasta dishes. I also heard that the Bianco Pizza is worth trying too. 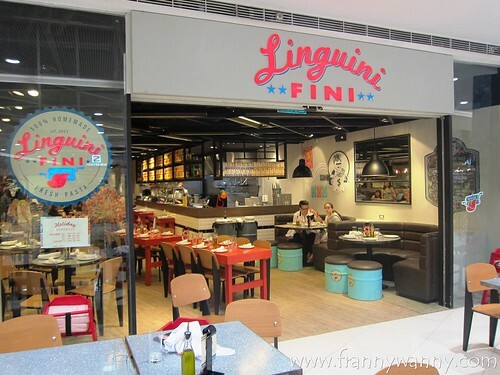 Check out Linguini Fini at Level 3, SM Mega Fashion Hall, Edsa cor. Julia Vargas Ave., Ortigas in Mandaluyong City. Call them at 531-3302. Pasta serving seems too small for P495? I hope it's good, though, to compensate for the price. the pasta was good just lacking that oomph but I heard there are a lot more yummy items on the menu so I can't wait to go back. The porchetta is definitely a must-try...now, I'm getting hungry.